May 26, 5 PM Update: The chart shows the date of formation for the second named Atlantic tropical cyclone of the season from 1950 through 2012. The average date through 2011 was August 1, so Beryl is nearly 10 weeks earlier than average. 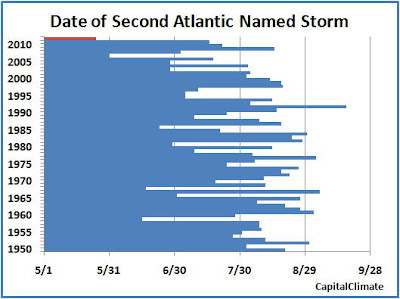 Although it's a hybrid subtropical storm, Beryl, which was named late Friday evening (May 25), is the earliest second storm of the tropical season on record in the Atlantic basin since names were assigned beginning in 1950. 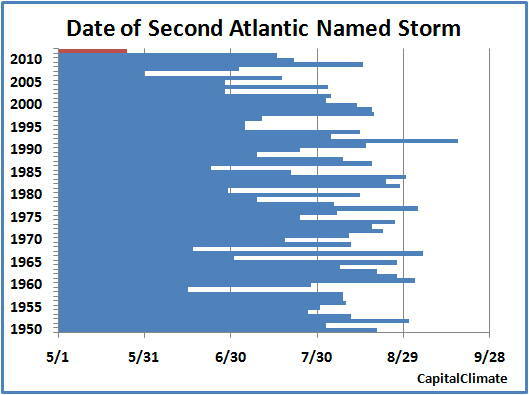 The previous earliest, and only other second storm as early as May, was Barry in 2007. Although it originated on May 31, Barry didn't reach tropical storm force until June 1. Prior to Barry, the earliest was Beulah on June 15, 1959. The latest was Bonnie on September 17, 1992. 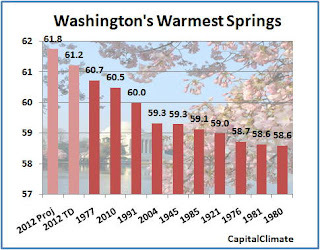 The 1910 chart below has been updated to degrees C.
Following closely on the heels of the third warmest winter and the warmest first quarter, Washington DC is well on its way to the warmest spring on record. The record warmest March was followed by a less extreme, but still above-average, April, and May has rebounded to 4.2° above average. Only 2 days so far this month, the 10th and 11th, have been below average, and that was by just 1° each. Even without a boost from the expected near-90° temperatures in the upcoming holiday weekend, the March-May average temperature to date of 61.2° is cozily above the current record warmest spring of 60.7° in 1977. Since the normal daily low temperature is near or above 60° for the rest of the month, it would appear that the record is virtually a lock. In fact, applying the forecast temperatures for the next 7 days and the climatological averages for the 29th-31st, the projected final spring average would be 61.8°, which is over 1° above the previous record. 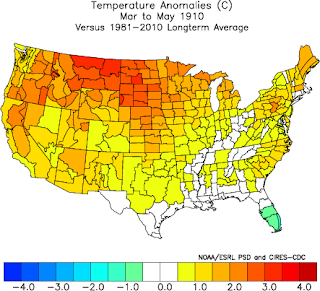 This is a bigger margin than the difference between the current 4th place spring (2004) and the 10th warmest (1980). Looking more widely, the predicted above-average temperatures over most of the U.S. east of the Rockies through the end of the month could contribute to the warmest spring on record for the contiguous 48 states. 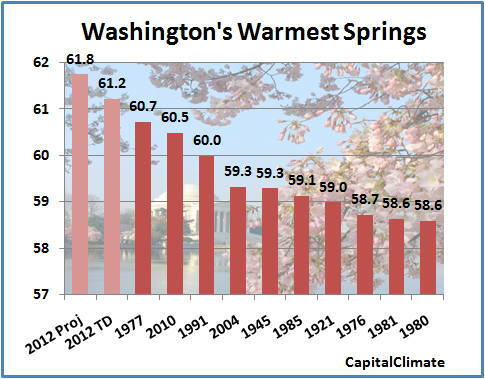 According to National Climatic Data Center (NCDC) records, the warmest spring occurred in 1910, when the national average was 55.1°. 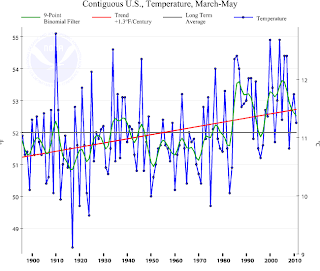 Unfortunately, the data are not available in compatible formats until after the end of the month, but the charts to the right show the temperature departures from average for March-May 1910 and for March 1-May 19 this year. 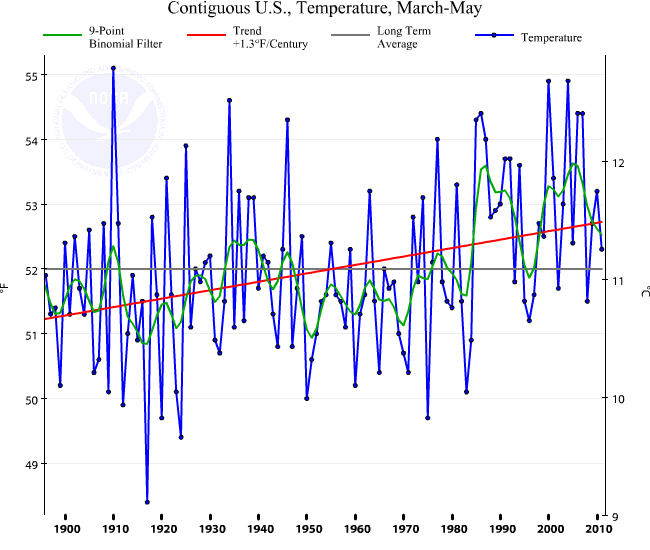 Note that for this spring to date, there have been no areas which have averaged more than 0.5° below the 1981-2010 normals. Furthermore, temperatures have been 4° or more above average over all or most of North and South Dakota, Nebraska, Kansas, Minnesota, Iowa, Missouri, Wisconsin, and Illinois. In 1910, these extremes were primarily limited to the Dakotas, extreme northeastern Minnesota, Montana, and half of Oregon, while the southern half of Florida was more than 1° below average.